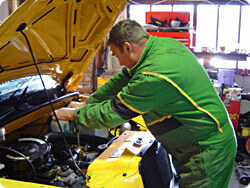 All of our vehicles follow a strict maintenance system. They are checked daily by the driver as well as having an M.O.T every 6 months. All vehicles are plated by Leicester City Council in order to be allowed to work for our company. Our vehicles are correctly insured for the transportation of passengers and goods. The company has valid insurance for public liability up to the value of £10,000,000. Ask for our free callback service. Free callback means no more waiting at the window, in a doorway or standing outside in the cold waiting for your taxi. If you are calling from your home then your land line will ring twice to let you know that your taxi is approaching. Do not answer the phone. If your taxi is not booked from your home address then give us your mobile number and it will ring twice when the taxi is approaching. Do not answer the call. Simply store the number 0116 2510603 in your phone as "taxi outside" and you will know when we are arriving. Please note: drivers do not have access to your telephone number; this is a computer-generated facility. For your added safety and peace of mind we will txt you back with the make, model, registration and colour of the vehicle that is being sent to pick you up. Thus ensuring you get into a correctly insured vehicle. Also useful when leaving a venue where there maybe lots of taxis waiting, especially at Christmas time. You know instantly which is your taxi!! Ask for free callback to avoid waiting outside in an unfamiliar area. Always try and pre-book your taxi if possible. Wait in groups and in a well-lit area. Ask to see the drivers I.D. badge. Give the full pick up and drop off address to get the best fixed fare available.